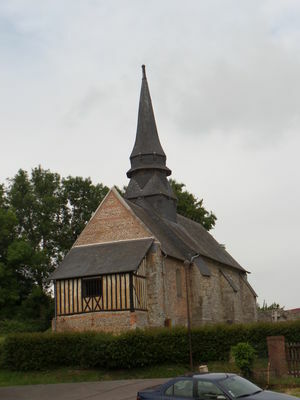 The Saint-Ouen church in Saint-Ouen-sous-Brachy dates from the 17th and 18th centuries. The walls show the various remodelling that the building has had to undergo over time thanks to the presence of various materials such as sandstone, flint and half-timbering. Every weekend, therefore, push the doors of this church to discover in particular one of the most beautiful canopies in the diocese. In fact, this one, made of wood, dates from the 16th century and houses a high altar. Moreover, its wood is carved, serrated but also crowned, painted and gilded. Saint-Ouen-sous-Brachy is therefore a Brachy hamlet in the same way as Le Gourel since there was a merger between the three villages in 1820. It is interesting to come and walk there for the church itself but also for its environment since it is located next to the Saâne, near an old mill converted into a flourmill: the Capron flourmill. There is no review about Eglise Saint-Ouen, be the first to leave one !